German military leaders expected an Allied invasion on the English Channel coast in late May 1944, when there was high tide, a full moon, good visibility, and little wind. When it did not come, and when the weather turned in June with a depression bringing storms, they felt they could relax. “There were all the less doubts that an invasion might happen in the meantime as the tides are very unfavorable in the following days and no air reconnaissance of any kind had given any hints of an imminent landing,” Field Marshall Erwin Rommel wrote on June 4, 1944, before leaving France for Germany to celebrate his wife’s birthday. But while German weather forecasters saw no possibility for invasion, Allied forecasters were frantically looking for an opening. They found one on June 6 — and on the 71st anniversary of the pivotal invasion, we’re looking at how they did it. 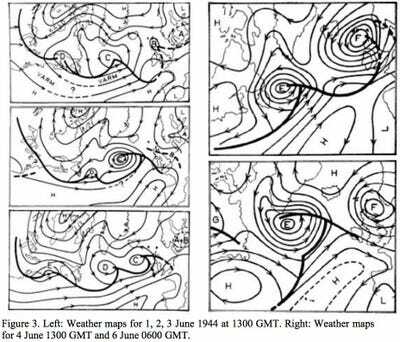 How the Allied forecasters found the opening is a subject of controversy, and they almost screwed it up. For an authoritative account, we’ve sourced a 2004 article from James R. Fleming, professor of Science, Technology, and Society at Colby College. Looking at the weather maps shown above on June 3, two meteorologists at US base Widewing in England, Irving Krick and Ben Holzman, said the planned invasion on June 5 was possible. However, teams of meteorologists at the British Admirality and the British Meteorological office, including most notably the Norwegian Sverre Petterssen, said an attempted landing would be unsafe. Chief meteorologist James Stagg persuaded General Dwight D. Eisenhower at the last moment to cancel the June 5 invasion. It’s a good thing he listened — stormy weather would likely have made the landing a disaster. “With some justification I could have been criticised for not being sufficiently ‘gloomy,’ for the weather and winds during the night of June 4th-5th turned out to be even more severe than Douglas and I had predicted,” Petterssen wrote later. But on June 4, the three teams recognised an opportunity on June 6 as storm ‘F’ was leaving and storm ‘E’ appeared to have stalled (at least according to Petterssen; according to Krick, Petterssen’s team still refused to clear an invasion). 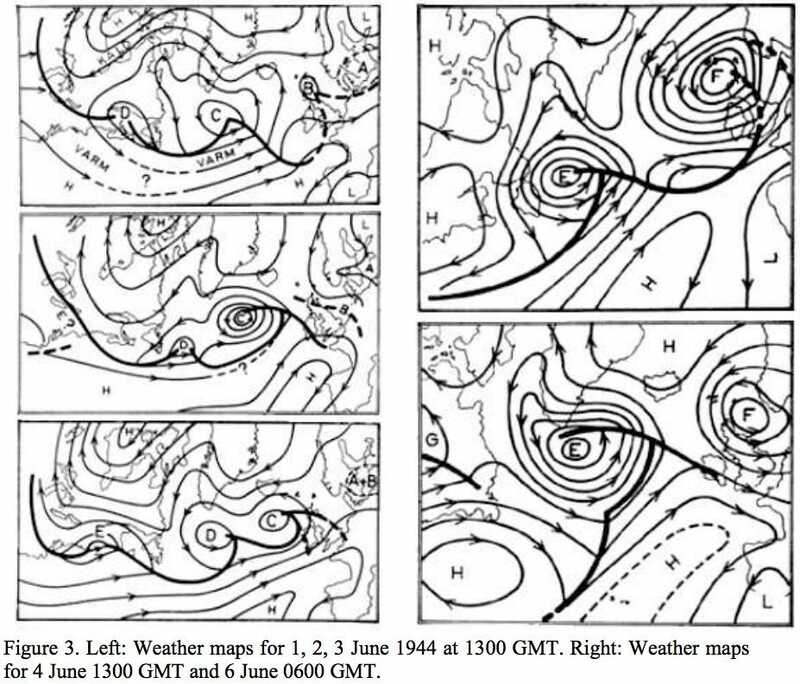 “A sudden and major reorganization of the atmosphere over the Atlantic sector” on June 4 “threw the forecasters into confusion” but by the end of the day the three teams “reached a state of harmony that had hardly ever been attained since February when conference discussions began,” Petterssen wrote (as contextualized by Fleming). 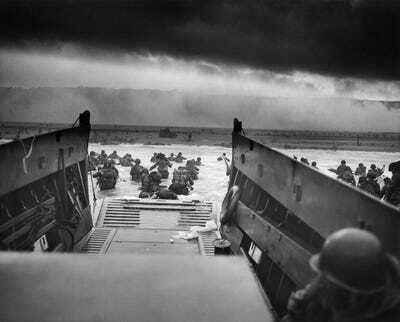 The Normandy landings were a go. Around midnight on the evening of June 5, the Allies began extensive aerial and naval bombardment as well as an airborne assault. The intricately coordinated attack continued in the early morning, as minesweepers cleared the channel for an invasion fleet comprising nearly 7,000 vessels. Allied infantry and armoured divisions began landing on the coast of France at 06:30. By the end of that day, they had gained a foothold in German-occupied Western Europe that proved critical to winning the war.